This is neither a history of ceramics nor a treatise on how they are produced. I imagine, however, that at least some readers share my own confusion about certain terms such as ceramic, terra cotta, majolica, china, porcelain, etc., so I offer a few definitions here below as an introduction to the story of the Royal Porcelain Factory of Capodimonte. If you start with clay and make a pot and bake it to make it brittle and water-resistant, you get a type of earthenware known as terra cotta (Italian for 'baked earth'). If you fire the product at a higher temperature, the result is called stoneware or ceramic. Still higher temperatures and denser mixtures with kaolin (a clay mineral named for a place in China where it was first used) in the basic material produce porcelain, considered the highest quality of ceramic. Fired clay products may be glazed such that the surface will hold painted decorations. Obviously, the nature of the finished product depends on the variety of clay used, the temperature it is fired at, and how it is glazed. 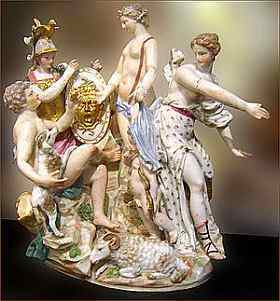 These vary greatly around the world, but geographical eponyms for ceramic products, especially types of porcelain, are well known; they include China, Meissen (or Dresden), Sevres, Limoges, and our own Capodimonte. Majolica ceramic is also named for a place—the island of Majorca, a major port where ships stopped on their way to Italy in the Middle Ages. They carried Hispano-Moresque majolica ceramic wares, typically glazed with tin-oxide enamels and fired at relatively low temperatures, then colorfully decorated. That particular process seems to have been invented by the Arabs and then introduced into Sicily when they conquered the island in the ninth century. 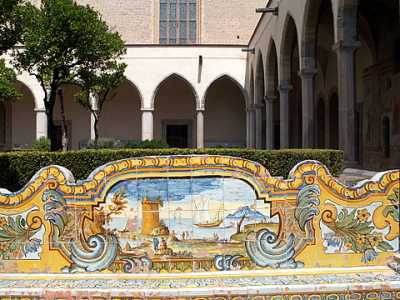 There are many examples in Naples of decorative majolica (maiolica in Italian). Two well-known artistic examples are the majolica courtyard of the church of Santa Chiara (see link and top photo) and the Garden of Eden floor mosaic in the Church of San Michele in the town of Anacapri on the island of Capri. There are, as well, countless other examples in Naples of majolica as decorative tiles, wall and floor murals, church domes, and statues and figurines used for serious settings in churches and Christmas manger scenes as well as for mundane uses such as apothecary jars and in restaurants and private homes. Important centers of local majolica production in Renaissance Italy were Orvieto, Florence, Bologna, and Faenza (among others in central Italy), Palermo and Caltagirone in Sicily, and a number of localities in Campania near Naples. (Faenza has also given us the synonym, faience, for majolica.) Some of the Italian production was so prized that Arab merchants bought it for their markets in the eastern Mediterranean. Both majolica and porcelain were produced at the Royal Porcelain Factory on the Capodimonte hill in Naples, the site of one of the Bourbon Royal Palaces (photo, right) in the 1700s. In 1739 Charles III of Bourbon, the new king of the new kingdom of Naples, followed the example of Royal Courts elsewhere in Europe and set up a porcelain factory. (This may have to do with the fact that Charles had just married Maria Amalia, granddaughter of Augustus II, the Elector of Saxony, King of Poland, and founder of the porcelain factory in Meissen in 1710. "You know, Charles, granddad had a great idea!") The factory was first housed in the Royal Palace, where the artisans spent a few years researching suitable clays, mixtures and glazes. (They found kaolin deposits near Catanzaro down south and started production.) Officially, porcelain manufacture started in 1743, and the production facility was relocated to the Royal Wood of Capodimonte. The porcelain factory of Charles III had a relatively brief existence —16 years— during which time it turned out high quality decorative porcelain. The factory mark used was a fleur-de-lis painted in underglaze blue. When Charles III abdicated in 1759 to return to Spain, he unfortunately took his Royal Porcelain Factory (lock, stock and craftsmen) with him. The facility was reestablished by his son, Ferdinand IV, in 1771 as the Royal Porcelain Works of Naples and continued production at the Royal Palace at Portici and in the main palace in Naples until production was shut down during the French rule of Murat in the early 1800s. Throughout its activity, the facility gained a reputation for quality porcelain and majolica, much of it decorative, but much of it also cultural in that the majolica was often painted with historical and religious scenes; also, the famous Neapolitan tradition of the Christmas presepe (linked above) was enriched by the addition of majolica ceramic figures, often crafted by prominent Neapolitan sculptors and painters. In the field of culinary culture, the factory specialized in such things as porcelain dinner services with, for example, plates decorated with neo-classical motifs based on the antiquities found at Herculaneum or with folk costumes from throughout the kingdom. Some of the splendid production of the porcelain factory is on display in Naples at the porcelain room of the Capodimonte Museum as well as at the Duca di Martina Museum in the Villa Floridiana. Although the Royal Porcelain Works was not reestablished as such after the restoration of the Bourbon monarchy in 1815, local private production of ceramics continued and, indeed, continues today with the production of decorative tiles in both majolica and porcelain for many purposes (including some very personal ones!). Small factories are located in Campania and Benevento. Also, ceramic sculpture is still created. 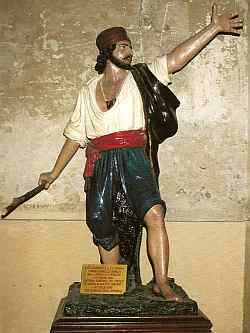 I started to think about writing this entry when I went searching for the origins of a six-foot statue of the Neapolitan revolutionary, Masaniello. The statue (photo, left) is done in glazed terracotta and is in the church of the Carmine. It bears the name of the sculptor, Raffaele Vaccarella, who created the work in the late 1800s. I actually found the small family workshop, still in existence and run by the grandson of the sculptor. He was kind enough to give me a book written by his own father, Giuseppe Vaccarella, called L'Arte della Maiolica, from which I have taken the image in this paragraph.